Have yourself a merry little Christmas. May you get everything you wanted and more. Unless you're evil. Then you get nothing but coal, you little weasels! For everyone else, hop off the computer, spend time with your loved ones, enjoy your new gifts, and have a wonderful day! Dragon Ball 2: Assault! is the sequel to Dragon Ball Origins. You can check out that game review here. Regardless, this game seems to add new stuff into the mix. It follows the Red Ribbon Army storyline of the show adding new playable characters, too, such as Bulma, Krillin, and Yamcha. Hopefully, this game makes it over to the West because the first game was quite good-- even as someone who isn't a big fan of the source material! Announcing the SPC Best of 2009 Awards! Last year, SPC celebrated gaming in 2008 with the first ever Best Of awards. Now they're back for another showing with the Best of 2009 awards! There's more categories this year plus some unexpected winners! This will once again be a five night event starting Sunday night and ending New Year's Eve. Last year, LittleBigPlanet came out on top as game of the year. Stay tuned to SuperPhillip Central to find out if your favorite games were nominated! SuperPhillip was writing a story with the click of his mouse. In hopes of faithful viewers sitting down to read. If you enjoy it, give your old friend SuperPhillip a shout! I still have not played MGS4, and after seeing what happens, I'm not sure I want to. Regardless, Shadow Moses Island is an isolated military compound set in the Arctic Circle, so you know winter is always just around the corner there! I remember vividly sneaking around the wintry base, taking down bad guys with stealth-based attacks, Snake's feet crunching through the snow, and having to wipe his feet off before entering inside the base. An awesome area in the Metal Gear Solid universe, and a great way to start of our countdown. I recently reviewed Goldeneye 007 after playing it for the first time, so nostalgia isn't the case with the pick. The Surface level is chock full of land to cover, cabins to enter, bad guys to blast away, and snipers to watch out for. The entire area seems so desolate as it should be being in the middle of snow-capped Russia. From the winter clothing of Bond and the bad guys to the soothing soundtrack accompanying the level, Severnaya is definitely one great winter wonderland. Gorilla Glacier is the fourth world of the original Donkey Kong Country. It's a snowbound land with large snowfall, slippery cavern floors, icy ropes to climb on, and memorable music to boot. This choice is not entirely nostalgia as it still holds up well today. 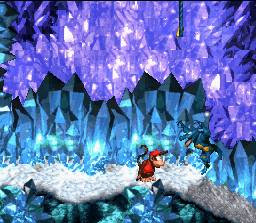 My favorite levels in Gorilla Glacier have to be when you're inside a colorful crystal cavern with ice on the ropes, floor, and probably off the Kongs' noses! 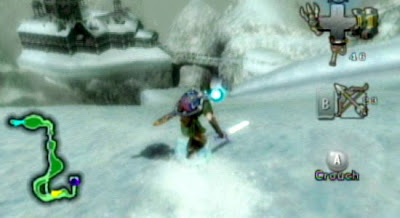 If you enjoy snow, Snowpeak from Twilight Princess will give you all you can stand... and then some! Players needed to use wolf Link to sniff his way through the area, or else they'd get lost in a hurry. By far the coolest portion of Snowpeak is the snowboarding mini-game where players race down the mountain to Snowpeak Ruins in order to win a piece of heart. It's such a chilling section of Hyrule that your teeth may start chattering just by looking at it! The Freezeflame Galaxy is so cool. Perhaps cold is a better word! Regardless, being able to become Ice Mario and skate on icy water was definitely one of the highlights of this galaxy. Another would have to be leaping off the summit of the area's mountain in order to grab the last two purple coins. 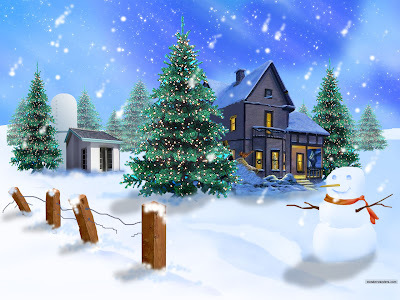 Everything from the environment to the memorable music gives off a wintry feel. 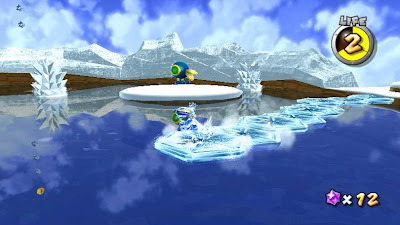 The ice side of Freezeflame Galaxy is but one half of the level. There's an entire fiery side to traverse! Who could forget the first part of Act I? 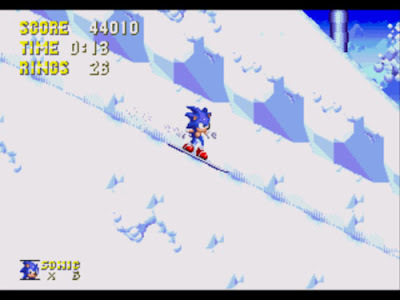 Sonic snowboards down the alpine mountain with an avalanche following him. This was the very first snow zone in a Sonic game, and boy, did they nail it. Wonderful level design, fun loop-de-loops, and beautiful backgrounds makes the Ice Cap Zone not only one of the best winter wonderlands, but also one of the best Sonic zones period! Frosty Village takes place in a village ready for Christmas full of seasonal lights, pine trees, following snow, and icy roadways. This race was for all vehicles: karts, hovercrafts, and planes. Frosty Village remains close to my heart with its round turns, icy lakes, and undulating roads. However, it's not my favorite winter wonderland in a racing game. No, that title goes to Mario Kart: Double Dash's version of Sherbet Land. 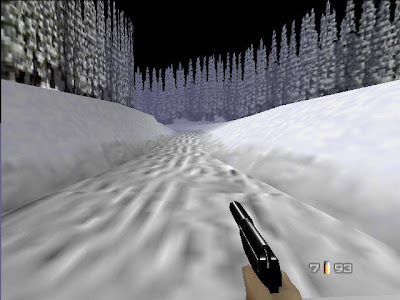 Compared to the icy lake that was the main feature of the Nintendo 64's version, Double Dash's is much more homely. 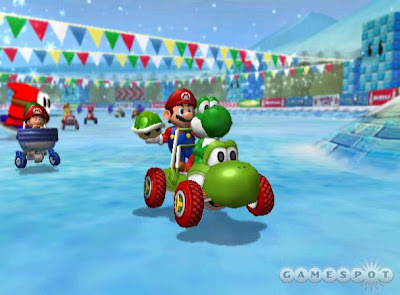 There's festive flags hung around, Shy Guys skating on the ice, freezies from Mario Bros. resting on the track, freezing anything they touch, and a cascade of snow falling to the ground. If there's one thing Retro Studios knows how to do, it's creating the perfect ambiance. They do just that with Metroid Prime. One area in particular is a favorite of many Metroid fans-- Phendrana Drifts. It's so well put together, you almost feel as if you're starting to shiver with how cold it looks. There's plenty of ways this is done by the icy architecture to the mountainous volume of snowfall. It all creates this wintry look to it. It's absolutely breath-taking. 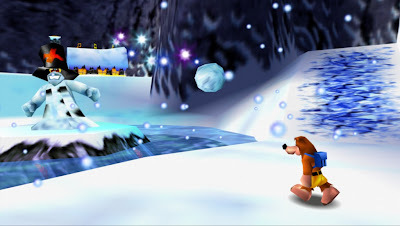 My number one winter wonderland in gaming comes to us from Banjo-Kazooie. It's Freezeey Peak. 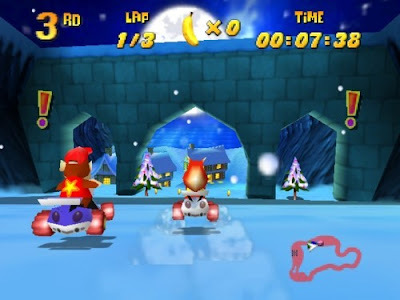 In the center of the level rests a skyscraper-sized snowman statue that has its own top hat, pipe, and scarf to sled down on. There's also evil snowmen around the base of the statue who love chucking snowballs at the bear and bird. There's even a Christmas tree that needs lighting up by Banjo! Add in some festive music, cool visuals, a Christmas vibe, and you have my top pick in gaming's winter wonderlands. I'd love to go on, but I have to quit. Perhaps I'll try giving a new article tomorrow a go! This could very well be the last review of 2009. I don't want to give a big fuss about this because then I'll have time for one more review, and this will all be for nothing! So forget about that... to be safe, of course. Let's talk Zelda. The Legend of Zelda: Spirit Tracks to be exact. Here's my review. The Legend of Zelda series has been around for over two decades. There's been many high-highs, and some lows thrown into balance things out. When it was revealed that for their next game, The Legend of Zelda: Spirit Tracks, that Link would be commanding a train, the whole fanbase was once again split, as most massive fanbases tend to do. Now that I've gotten a chance to sit down, don my engineer's cap, and hunker down with the newest Zelda, is this a spirited new take on the Legend of Zelda franchise? We meet our young, dashing hero, Link, a boy from a humble seaside town, as a lowly engineer on his way to get his official engineer's license. 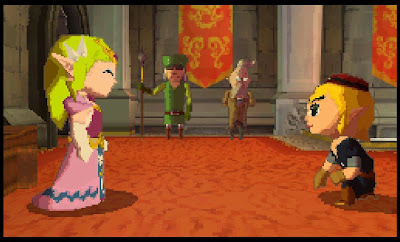 Link meets with Princess Zelda who with Link's help, sneaks out of the castle. Not a wise idea when you have a crazed chancellor seeking to usurp you and your power for his own gain. Enter Cole. He's the primary villain of the story. 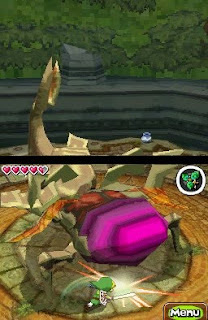 With help from his right-hand man, Byrne, Zelda's body and spirit become separated, and the tower of spirits splits apart into several pieces. Now Link and a select few are the only ones who can see or communicate with Zelda, the spirit tracks, the roads of Hyrule, are vastly disappearing, and monsters are taking over the land. It's up to Link, and for the first time, Zelda, to right the wrongs of Cole and stop him from resurrecting an ancient evil bent on destroying the land. Certainly more interesting than just being a boy who's an engineer, now he can be a hero who's an engineer! 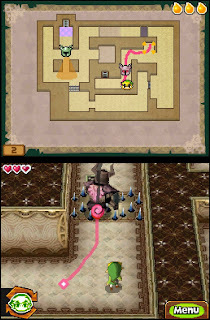 The structure of Spirit Tracks is somewhat different than past Zelda games. First you enter the tower of spirits. This dungeon is much less strenuous than Phantom Hourglass as you need not retread through the same floors each time you visit the tower. After running through several floors, you'll pick up a rail map. This opens up new spirit tracks to rock and roar on that will lead you to the next realm or area you have to go. There's four realms in all: forest, snow, ocean, and fire. Each takes up one corner of Hyrule's map. Anyway, after meeting up with one of the elders of the realm which is an arduous process all on its own, you'll unlock new tracks to reach that realm's temple. Complete the temple, and part of the tower of spirits will be restored, allowing you to invest your time and energy into the process anew. It's a cool formula, and it definitely works. Though the traditional dungeon formula is used, it feels much fresher in this game. The four realms of Hyrule house different races and towns to explore. The forest realm is home to various Hyruleans, the snow realm houses the kooky Ayouki people, and the fire realm makes its lava shores and mountainous ridges home to the rock-chomping Goron clan. 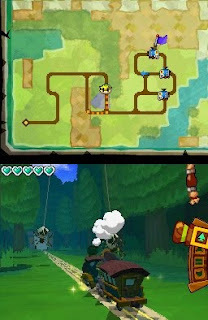 Apart from towns and villages, when enough spirit tracks are restored, you'll start coming across secret areas completely optional to the player. These usually house some excellent unlockables such as a hidden boss battle! There's plenty of side content to take in and explore such as collecting health-increasing heart containers, arrow and bomb-boosting quivers and bomb bags, treasure which can be sold or traded for new train parts, force gems (first seen in Four Swords) to open up new tracks, and many more. Link's main mode of transportation this time around is a locomotive train. The paths you can take are far more limiting than the open sea of Phantom Hourglass as you have to follow tracks. As you complete several sidequests and optional content, you can unlock new tracks to plot your routes on. Controlling the train is easy-peasy. You simply chart the course which can be changed at any time while in motion. While in motion with Link's locomotion, you have a whole assembly of tasks assigned to you. You have a cannon to thwart off attacking monsters which is as easy as a tap on the screen of where you want your shot to go. You have a whistle perfect for shooing away sleeping animals sitting along the tracks and to scare away certain monsters so you need not encounter them in battle. When you reach a junction, you have the choice of staying the course or pulling the switch to change direction, from left to right or from right to left. Pulling into a station is enjoyable enough to do. I personally love charging in fast, and then screeching into a quick halt. The only real problem with the train is that it can be tedious going over long distances, but thanks to various warp gates this problem is somewhat remedied. Later in the game you'll be able to transport passengers and freight from town to town for various rewards. When transporting a passenger, there's signs to watch out for and follow such as speed up or slow down. Violating these rules decreases that passenger's happiness. If it goes under a certain level, you fail. With moving freight from coast to coast, city to city, and realm to realm, it's important not to let monsters shake up your train or you'll lose some cargo. Some freight is time-sensitive and needs to be transported within a given amount of time. These missions are mostly optional, but the rewards are great as you can earn force gems to unlock new paths for your train to take. As for temples, there are five main ones in the game plus various trips back to the tower of spirits which is a dungeon all onto itself. The tower of spirits plays similarly to Phantom Hourglass' Temple of the Ocean King, but as previously stated there's no backtracking to speak of. It's purely optional to go back, use items to open up previously inaccessible areas, and grab some new treasure for a certain character in the game. Each time you return to the tower of spirits, a new section of the tower has been restored, conveniently putting your newest item acquired to the test. Phantoms return, too. These big armored oafs are impervious to Link's ordinary sword, but by collect three light shards located in the dungeon, you'll be able to attack them from the back, freezing them, and allowing Zelda to inhabit their body. Creepy! The tower of spirits is the only place in the game where teamwork between Link and Zelda is used unfortunately as the puzzles and obstacles are so cleverly designed with both of them in mind. Zelda for instance hates rats, even in her spirit form. By defeating all the rats and blocking up the hole where they come from, Zelda can get through the area unscathed psychologically. The five temples each have their own theme: forest, snow, ocean, fire, and sand. Each one has obstacles, enemies, and puzzles pertaining to said theme. The goal of every temple is simple. Find keys to open locked doors, solve puzzles to open sealed doors, acquire the temple's special item (more on those in a bit), retrieve the big key to open the boss' door, take down the boss, and restore a piece of the tower of spirits. Simple enough, right? 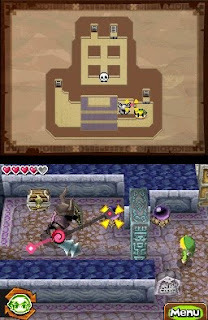 Generally, the rule of Zelda games is that the item you find in the dungeon is the one you use on that temple's boss. There is no exception to that rule in Spirit Tracks. Items are an important part of the Zelda universe, and again, there's no exception to that rule either in Spirit Tracks. Link has an impressive arsenal of weaponry from faithful standbys like bombs and bows, but there's also new twists on old favorites such as the boomerang. Impossible on any other platform, you can draw a path for the boomerang to follow. This is a must for several switch puzzles. You can also carry fire and ice across torches to light them up. There's also new items, too, such as the sand staff and the awesome whip which lets Link cross chasms without trouble, slap away enemy shields, and much more. Finally, one of most important items of the game is the spirit flute. As you venture across Hyrule, you'll come across numerous stones that give off a faint melody. By playing the melody on your flute, you can learn new songs that help you out such as a heart-refilling song, a song of discovering buried items, and more. Playing the spirit flute is easy, though it will make you look like a fool in public. Forget them though-- you're saving the land of Hyrule! You slide the stylus on each pipe and blow. Though you will need rhythm to pass some of the elder's tests, so keep that in mind. Long ago, I had stated that Kirby: Canvas Curse made the best use of the DS' features. That game has been usurped by Spirit Tracks. You control Link by pointing the stylus on the screen and moving it about to move Link. Tap enemies to take them out, double tap the screen to perform a roll, and so forth. Playing with Zelda isn't as complicated as I had once thought it would be. There's a little round button underneath whoever Zelda is possessing. By tapping that, you can draw a path for Zelda to follow. Sometimes she'll get caught on a wall, and your drawing will be for naught. A clear majority of the time, however, it indeed does work. You can also call her to attack enemies or simply follow Link around. Overall, the controls feel intuitive and fresh. Sure, there were times where I wanted to use the d-pad, but these moments were vastly outweighed by the positives of the touch screen controls. As a looker, Spirit Tracks definitely pushes the DS' hardware for sure. There's an impressive amount of polygons being churned out, and there's no sign of slowdown whatsoever. This is definitely one of the better looking 3-D games on the platform. The soundtrack of Phantom Hourglass, I felt, was uninspired. It just didn't have that many memorable themes. Perhaps the developers thought the same because the composers this time around have outdone themselves. There's so many toe-tapping, epic-sounding songs and themes to listen to in Spirit Tracks. The overworld and boss themes are just a sample of my favorites. This is definite soundtrack of the year material, boys and girls. 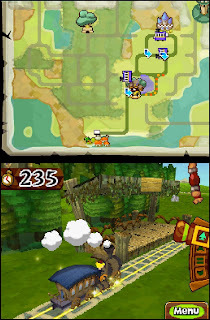 As a total package, Spirit Tracks greatly outperforms its predecessor in both gameplay and presentation. There's so much more to do and see, so many more bosses to beat down, and so many sidequests to take part in. Spirit Tracks can take anywhere from 15-25 hours to complete, and you'll mostly have fun all of those hours you play. An obvious (from my point of view) recommendation for all DS owners. 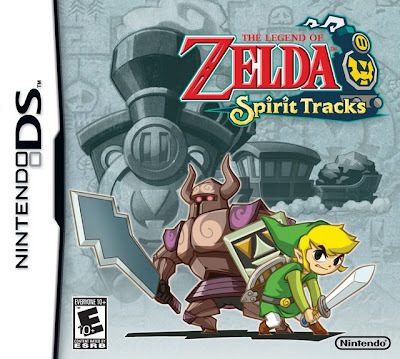 The Legend of Zelda: Spirit Tracks is the must-have game of the season for handheld gamers. ModNation Racers for the Playstation 3 is one of my most anticipated games of 2010. Only Super Mario Galaxy 2 outranked it. That said, I was very happy to learn that was invited to become a part of the beta for ModNation. I've had some time to tinker around with the game, get the ins and outs, and just play for a few hours or so to form some impressions. Will ModNation Racers push your pedal to the metal? As is the beta, not all the features have been included. The majority of the track parts, avatar parts, and modes are locked away. As you start the beta, you're thrown into the hub, a circular area leading to all of the modes and options in ModNation Racers. There's the top three mods and karts of the day, a featured collection of tracks, online racing, quick race (which only has time trial available and not the quick race option), and the creation station where all the mods or game avatars, vehicles, and tracks can be created, downloaded, and shared. Batman has a larger wingspan than you'd think. The creation station is where all the imagination takes place. You can design a mod, but the options are rather limiting as most of the tattoos and art parts are locked for the retail release. Regardless, there's plenty of creative people already making famous game, television, and film characters such as Mario, Luigi, Link, Spider-man, Batman, Kratos of God of War fame, and many more. I've no idea how these characters are created, possibly gifted use of tattoos, but nonetheless, these are very impressive! Needless to say, I downloaded a wealth of characters. Also you can design a vehicle for your created or downloaded mod. You create the vehicle body, the paint job, and the size of your car. Nothing like Batman cruising in style in his patented Batmobile! A cavalcade of characters from comics and games! Luigi's got a sweet ride! Track creation is the most complicated and rightfully so. It'd get boring rather quickly if the options were small. You could only design so many varied types of tracks. Thankfully, there's a host of options to choose from to create your track the way you want it. First, you can set up the topography of your track. From small hills to rugged mountains. Then you place your track. It's just like driving in the regular game. You can choose when the track slopes upward, downward, make it flat and so forth. Once you've created a full lap, you can start altering the track from dirt roads to concrete town streets, twist the track, widen or narrow parts, add shortcuts either obvious or hidden, and branch the track into several parts. You can also place scenery and props or have the game do it for you. There's only one available setting in the beta, the alpine, but the full release will more than likely feature many more. I made a quick, beginner track called Windmill Valley. It's a rural road weaving through numerous windmills and around a beautiful blue lake. There's one big shortcut on the track, and it's obscured by multiple trees. It's a simple enough track that offers enough drifting opportunities to be fun for all skill levels. Nothing mind-boggling here. Some shots of Windmill Valley, my first real course. After your mod, vehicle, or track is completed, you can share it online. Unlike LittleBigPlanet, it's already much easier to find selected works by various creators. It's not an exact science, however, so I'd love to see that improved. Regardless, if you haven't a creative bone in your body, you can do what most of us are doing and download other people's work. There's already an exhaustive amount of great tracks, mods, and vehicles to select from, alter, and race away with or on. Mario gives the thumbs up to his opponent. Now that I've briefly gone over the creation aspects of the game, let's move onto the core mechanics of the gameplay. Firstly, starting up the game and driving for the very first time, the controls feel extremely loose. By now I've gotten used to them, but I'd still prefer some tighter steering instead of what we have now. Drifting is the main mechanic used in ModNation Racers. The longer you drift, the more your boost meter runs up similar to MySims Racing of all games. You can use your boost energy not only to boost (obviously), but you can also use it to shield yourself against opponent attacks. You can also gain boost points by drafting behind other racers as well. Batman tracks down the Joker out in New Mexico. Performance-wise, there's way too many load screens, and they're quite long, too. Many of those playing the beta have had the game crash on them multiple times. I've not seen this myself, but I'm knocking on wood as I type. Additionally, the framerate is set at thirty frames per second, and that number dips quite often with frequent slowdown and stuttering. Visually, the game is gorgeous with striking backgrounds, detailed landscapes, and plenty of neat things to look at as you breeze by. Mamma-mia! I'm on a competitor's console! All-in-all, ModNation Racers has several problems that bar it from being a perfect game. Thankfully, the game is only in beta right now with some form of release for the retail game in 2010. There needs to be work on the framerate, loading times, and looseness of the controls first and foremost. As it is now, ModNation Racers is shaping up to be an excellent kart racer with a wonderful creation system implemented into it. Whether or not the game rivals the quality or sales of something like Mario Kart is yet to be seen. Either way, you're looking at one of the rides of your life with ModNation Racers. The week is upon us-- Christmas week, and the VGMs are here to celebrate in style! This week we have music from Final Fantasy IX, Diddy Kong Racing, Sonic 3D Blast, Banjo-Kazooie, and The Munchables. So sit tight by a warm fireplace, and enjoy these Christmas-y tunes! Kuja is to Zidane as Sephiroth is to Cloud. Except Kuja vs. Zidane isn't milked for all its worth every chance the developers get. Regardless, this piano solo piece is masterfully haunting as it is relaxing. It's Kuja's Theme for Final Fantasy IX on the original Playstation. David Wise, longtime composer for Rare, recently left the company. His works include Starfox Adventures, the Donkey Kong Country series, and yes, Diddy Kong Racing. He was relegated to side projects for the longest time that he felt the need to leave. The theme I've selected this time from DKR is Walrus Cove. Perfect for Christmas, no? We've yet to see The Munchables appear on the favorite VGMs of mine. Can't say that any more as here they are, chomping and consuming all that they see! The Munchables was a Pac-man meets Katamari Damacy type game. This song takes place in an area high above the clouds with cannons! It's Blue Sky Lounge. Until next week, Merry Christmas!